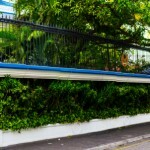 The Maldives’ embattled judiciary, which has long-resisted calls for reform, has launched a series of workshops, emphasizing access to justice, improving efficiency and skills, and administrative reform. 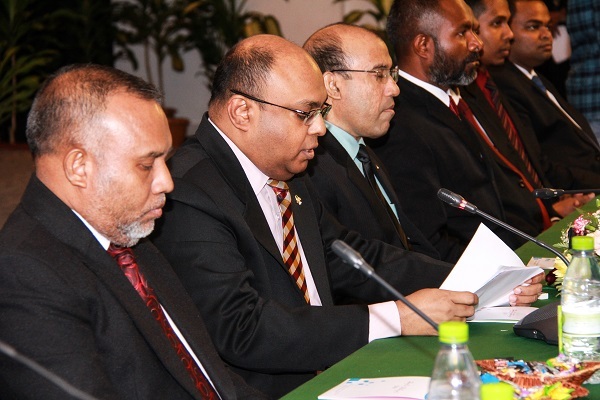 In an apparent reform effort, the Maldives’ embattled judiciary has launched an action plan and a series of workshops, emphasising access to justice, improving efficiency and skills, as well as changes to the way the judiciary works. 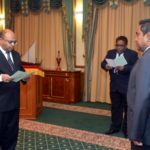 The latest conference on May 11 brought together judges of the supreme court, high court, and the superior and magistrate courts, where Chief Justice Abdulla Saeed called for greater transparency and respect for ethics. The police chief, the prosecutor general and the attorney general participated in separate sessions to discuss better coordination. The two-day conference follows the launching of a judicial sector action plan in February, a judicial pledge to stop human trafficking earlier this month, and a workshop for chief magistrates on the new penal code and the recently ratified criminal procedure code last week. “One of the most important principles is to make sure that judges are impartial and independent. To build and ensure trust of judges, we have to work in a way the community perceives to be fair,” he said. The Maldivian judiciary has been in the spotlight since 2012, when the arrest of a top judge triggered former President Mohamed Nasheed’s ouster. Calls for reform have been mounting in the past year after several high-profile politicians, including Nasheed, were jailed in trials widely condemned as unfair. The judiciary will focus on human trafficking, relations with the media and businesses in the coming year, he said. 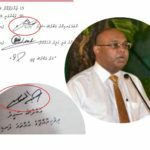 A mercantile court will be established this year, he continued, adding that judges plan to contribute to an economic ministry effort to identify why the Maldives has been declining on the World Bank’s annual Doing Business Index. 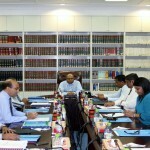 A colloquium titled “Doing Business in the Maldives; A Judicial Perspective” has been planned for August. Saeed went on to announce an event for press freedom in July, called “Open house judiciary: engaging with media for media freedom” for July. 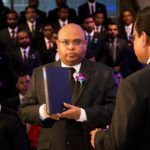 The judiciary’s relations with the media is under strain, with several outlets barred from the criminal court, ostensibly for taking a photo of the court’s acting chief judge. The judiciary plans to launch an action plan to tackle human trafficking in August, a workshop for data collection on the issue in September, and a national workshop in November that will bring together judges, prosecutors, state lawyers and the police to discuss challenges and progress in tackling human trafficking. A code of conduct for judges, templates for court orders, audio and video conferencing facilities, measures to improve performance and the regular publishing of judicial sector statistics were also discussed, according to the department of judicial administration. The judicial action plan, launched in English in February, lays out four areas of focus for the next year. These include enhancing access to justice, measures to improve justice delivery, accountability, integrity and oversight, and plans to increase coordination within the criminal justice system. The judiciary plans to hold awareness campaigns through social media and “enlightenment workshops and theatrical presentations aimed to demystify the justice system,” according to the 17-page document. A complaint management system, regular trainings for judges “on relevant skills and capacities for better performance” and compulsory legal education for lawyers were also included in the plan. Plans to “decongest prisons” meanwhile include the establishment of clear guidelines on the use of alternatives to jail, the document said. Judges also plan to comment on laws, including the long-awaited evidence bill.